An Israeli NGO is on Monday launching a smartphone app that allows users to find the remains of Palestinian villages that now lie inside modern-day Israel. The launch is timed to coincide with Israel’s 66th “independence day”, which begins at sundown, when the Palestinians remember the “Nakba” or “catastrophe” that befell them when Israel came into existence in 1948, and 760,000 were forced into exile. 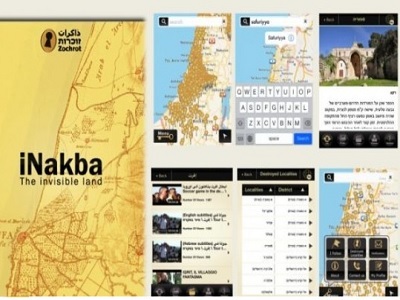 “iNakba” features an interactive map and photos of buildings and houses that Palestinians fled or were driven out of during the conflict surrounding Israel’s creation in 1948. “Many Palestinians have difficulty locating their home towns and villages (in Israel and the West Bank), because cities or Jewish settlements have been built on top of them,” said Raneen Jeries of Zochrot, the NGO that developed the app. “There’s a file on each of hundreds of Palestinian villages or cities, and you can find information and see old and new user-uploaded photos about the locality,” she told AFP. Zochrot, based in Tel Aviv, campaigns for Israelis to recognize the right of Palestinian refugees to return to their homes, along with their descendants. The right of return for Palestinian refugees has long been a key sticking point in Israeli-Palestinian peace talks, the latest round of which collapsed in late April after nine months of apparently fruitless negotiations. Israel fears that any flexibility on the issue would open the floodgates to millions of refugees, which Israel considers ‘a demographic threat’ to the “Jewish and democratic character” of the state. Palestinians mark Nakba Day every year on May 15. “Our aim is to make Israeli Jews aware of the Nakba, which uprooted hundreds of thousands of Palestinians,” said Liat Rosenberg, director of Zochrot. Palestinians in the diaspora can “follow” their own villages to watch for new information or pictures posted by those who are able to visit them inside Israel, Jeries said.